So, tonight I cleaned my kitchen. Maybe in your house that's an everyday thing but my big girls have been doing the dishes after dinner most nights for the last couple of years (yes, it's pretty much as wonderful as it sounds). However tonight they messed up and didn't do their chores, and since Grayson was asleep I decided I would go ahead and clean the kitchen so things wouldn't pile up. As I wiped down the counters I found a note from a friend. I had stashed it there specifically so that a) it wouldn't get lost or destroyed and b) so that I could read it again one day when I'd needed the encouragement. So with a dish rag in one hand and a kitchen towel over my shoulder I sat down at the kitchen table and read that note again. My friend reminded me of who she sees when she looks at me - not someone who is a mess, or a disaster or boring or whatever, but someone who is a gift. And some other really nice things that helped me remember who I am. I put the card in a more semi-permanant place where it should be safe from the fingers of my 18 month old but where I'll find it again and as I got back to wiping counters I felt the Holy Spirit remind me of the words Jesus said to Martha. "she has chosen the good part, which shall not be taken away from her." I shared this picture on my Instagram the other day - it's one of my all time favorite pictures from when Eli was a baby because it is just so honest. This is exactly what my room looked like and pretty much what I looked like most days back then. Honestly it is still what I look like most days - except for that shirt is too small for me now so one of my big girls wears it and it looks so much better on her than it ever did on me. I don't think it is any surprise to anyone who knows me at all but I am one of "those moms" who struggle with housework. I had a messy room as a kid (I hated it when my mom made me clean because I could never find anything!) 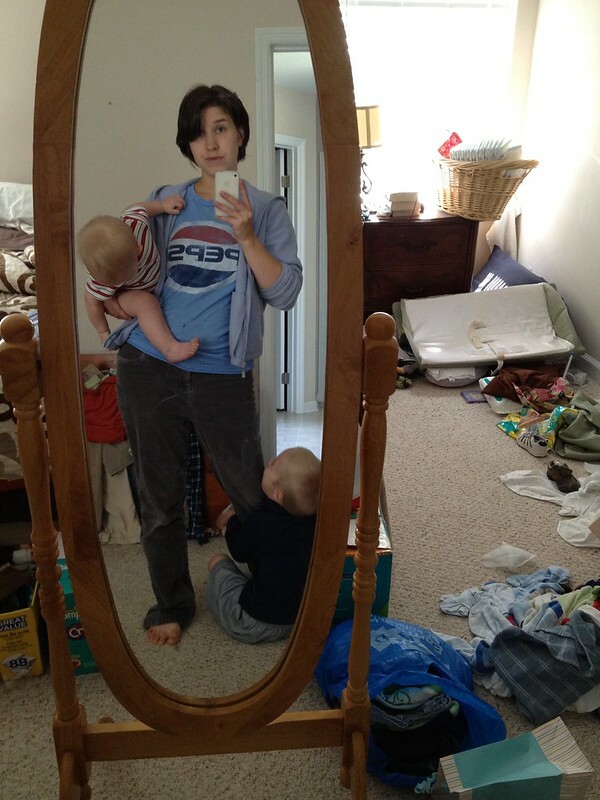 and I struggled with a messy house for the approximately five seconds between when we got married and I got pregnant. I struggled under the mountain of laundry and the kitchen sink full of dishes and a bunch of little kids. I'd momentarily "get my act together" and luxuriate in the bliss of clean surfaces but that never lasted. I just can't wash dishes while my baby cries and I don't care if there is laundry to be folded if my kiddo needs a cuddle, and since we are being honest here - I would way rather read a book than vacuum. I am also super lazy about dusting, I would just way rather do other things that help me calm down after an emotionally overwhelming day. Yes, this drives my neat freak very tidy husband totally nuts. During these fifteen years of struggling with the housework I have struggled even more with feeling guilty about it. Over the years I've taken small steps away from the burden of shame and I have let go of the the jealousy of comparison. I have more or less stopped judging what is hard for me against what brings other women joy, bust still. It's a temptation to feel like I'm less of a good mom because I'm a horrific housewife. I'm not saying that y'all all stop caring about your housework or become more like me, not even for a minute but, over the years I have chosen to snuggle babies and sit and read with little kiddos. I've sat and talked with teenagers. I've taken a nap (because I'm just not the same person as when I've had enough sleep). I've read books and stayed up too late writing. I've chosen to go have coffee with a friend, and chosen to just go take a bath and think. Over these fifteen years I have become the result of all of those little choices and maybe not all of those choices were always the "best" ones but a lot of them were really good ones for me and I am thankful for what that has done to the inside of me. So what I am saying is that we all keep taking another step away from the "shoulds" and the "oughts" and the lies of shame - it isn't helping anyway. You're not able to do everything all of the time. Some balls are going to drop - so take a second and make sure they are the right ones. So Dear Mother of Littles who Struggles to Keep Up with the Housework - I'm cheering for you. On the flip side of this weakness there is a strength. Ask God to open your eyes to it. Ask the Holy Spirit to help you see your days the way Jesus sees them. I bet he loves the way you listen and the way you play. The way you teach and the way you take your time when you could have rushed. He loves every minute you spent tickling that baby and every moment you spent looking at the random bug your kid is interested in because He loves to see you love so well. I don't think God looks at some Heavenly chore chart that is lacking in gold stars for the day, not even a little. He sees the hours spent rocking crying babies and He notices how gently we bathe them after the massive diaper blow-out. This is the stuff of Heaven here on earth. It's dificult when you struggle to keep up with housework when you have one child, and I assume it's more difficult when you have two children. And I don't know how some moms manage to juggle job and housework and kids! That's insane! I've recently written an article about women in a male-dominated industry - as we woman do need a lot of support and understanding.